Why You Should Write Articles? Many People seldom think about the money that they can and would make writing articles and submitting them to “content-hungry” websites willing to pay them top dollar for interesting content. It is true! If you will take the time and commitment needed to write and submit them, you can make some serious income from your efforts. All you have to do is “find the right sites” to submit your works. I recently have written a ebook that details in the book a list of links to some of the best article submission links for payment. It took a lot of time developing that ebook to find these websites but I made it convenient for those that need that time searching to write. 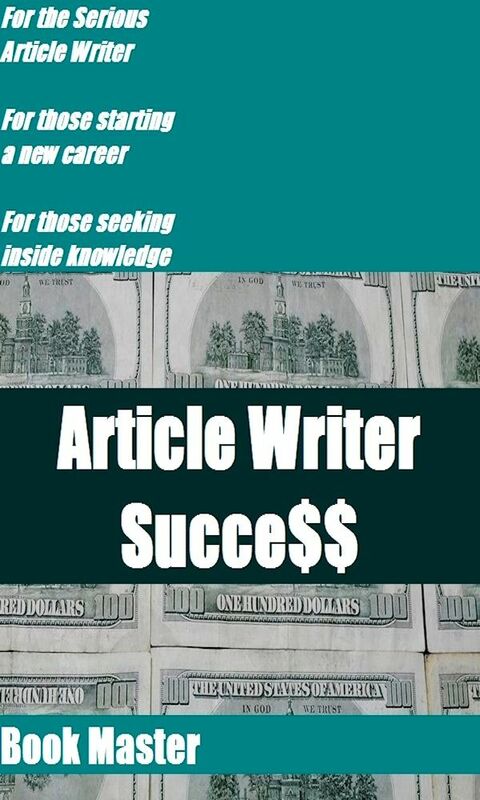 This book can help you succeed in article writing and will well pay for it’s price many times over once you collect payment for the first article you sell. If you’re serious about Freelance article marketing, then you should invest a few dollars for this book with the links and surprise yourself with what you can do. Do yourself a favor and order a copy today! I’ll tell you a secret probably many know little about. You can make some good money writing articles and submitting them to websites that pay you for that content. The key to being successful with it is having a serious and sincere attitude that you’re working for someone else just like a day job. I just published a new eBook on Amazon that gives you some of the best links to read what these websites expect and the amount that they pay. Once you’re article is submitted, reviewed. accepted and published, the payment for them is deposited into your Paypal accounts. This is a good way to get started in a writing career for those that are interested. The more companies you work with just increase the amount of income you can make. It’s basically the same thing as being hired by a company but you’re in the freelance business working for yourself. Working with these content hungry websites only furthers yourself for the possibility of finding a job paying great money writing for a living. I do freelance article marketing on the side and bring in enough money each month to pay most of the bills. Some months after I did a little more writing than usual, I made more that following couple of months. The more time you invest writing content and investing in writing great articles, the more income you can earn. This new book I published will give you enough of the best paying websites to work you silly or in other words, keep you so busy that you will succeed. I also tell you in the book how to write your articles to better the chance of it being approved and published. Some people might think it is hard to do this and be afraid to try it, but I promise you that if you will treat it like a job, you will make good money.